With Oktoberfest now in full swing, I thought it topical to go back to my Munich series and write up a quick overview of our experiences dining out during our trip. Since we had the flu for part of our visit, we didn’t go to as many cafes and restaurants as we usually do on our travels! Obviously this is our personal experience only – everyone has their own tastes and opinions as I found when I did some research on Tripadvisor. The same restaurant could be rated as excellent by one person and terrible by the next! The famous Hofbrauhaus fronted on to the street at the back of our hotel, the Platzl (more details from my earlier post of the Platzl Hotel Munich here). Mlle, our daughter, had a room at the back of the hotel, which was more prone to noise than ours towards the front and there was one especially loud and raucous evening where the revellers partied well into the night – fortunately it didn’t faze Mlle! We thought we should check the Hofbrau out one evening for ourselves but there was not a table to be had anywhere, it was absolutely packed with tourists and we didn’t feel inclined to wait around. Instead we headed off to Augustiner am Dom, which I’d spotted when I went round the Frauenkirche (cathedral) a couple of days earlier. It was much too cold to sit outside (in our opinion!) but we easily found a table in one of the cosy cellar rooms and the staff were friendly and helpful. We enjoyed hearty Bavarian fayre in a warm and cosy ambiance. The portions were huge (I had the fish and there were several fillets piled up on a bed of delicious white asparagus along with a generous serving of new potatoes). The produce was fresh and seasonal – as well as the white asparagus (Weiss Spargel) and potatoes, we shared a dessert of plump, juicy strawberries with lashings of cream. We felt as if we could have been in a large Bavarian country farmhouse. There was an elderly lady sitting at the table next to us (she must have been about 80) downing pint after pint of the local brew – the waitress chatted away to her and she was clearly a regular. Eventually she tottered off home and finally we did the same (or maybe “waddled” back to our hotel would have been a better description). 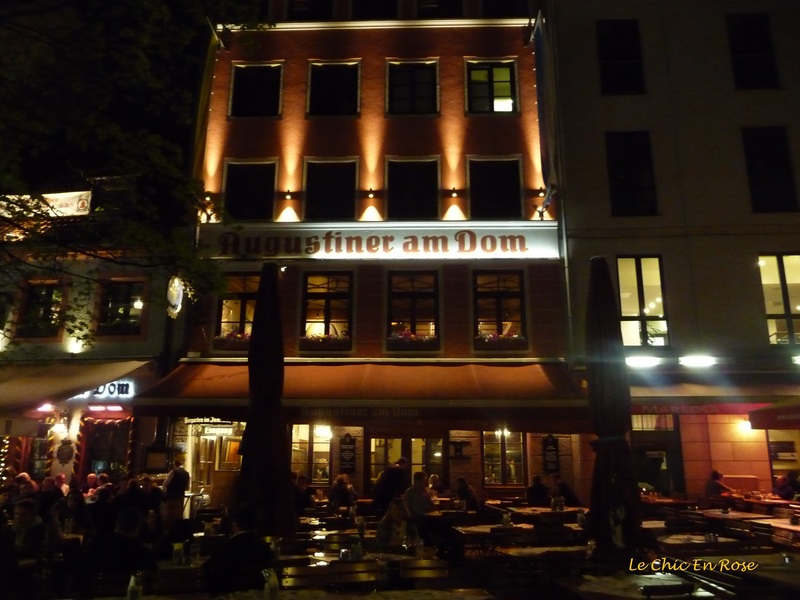 Zum Duernbraeu is another traditional restaurant a few minutes from the Marienplatz. It was originally established as a brewery in medieval times – according to the sign at the entrance it dates back to 1487. Another place with a warm traditional feel, a pretty beer garden and generous portions of typical Bavarian dishes, the ubiquitous “Wurst” or sausages, dumplings, pork hock and sauerkraut. I had a quarter of a duck, which I thought might be more manageable. All I can say is that it must have been the largest duck in Bavaria in its day – the serving was huge! The photos (including the ones at Augustiner am Dom) were all taken in dim light on my iPhone so please excuse the quality but it gives you an idea of the restaurants. My portion of a quarter (viertel) of duck! For a complete contrast one night, we decided to try the cosy looking Italian restaurant we’d walked past numerous times during our comings and goings from the Platzl Hotel. Ristorante Galleria was just down the road from the Platzl in one of the quaint old buildings along Sparkassenstrasse. The webpage, which unfortunately does not appear to have an English translation, describes the chef Andrea Pomiato Colesso, as “ein Kuenstler” (artist) in his preparation of fine dishes using high quality ingredients. It likens the dining experience, “wie eine Reise nach Italien wenn Sie die Galleria betreten” – “like a trip to Italy when you set foot inside the Galleria”! The decor is certainly bright and snappy and wouldn’t look out of place in Milan or Rome. It was certainly a memorable gastronomic experience and definitely not a cheap one! However we had barely gone out to eat during our first few days in Munich and we don’t get the opportunity to see Mlle that often now that she lives in London, so we felt a splurge was justified. We were encouraged to try the chef’s “degustation” a selection of small exquisitely prepared dishes designed to be a feast for the eyes and taste buds. At this point it is best to resort to illustrations – I forgot to photograph the first dish, a small spoon sized serving of a pea and mint soup but here are the subsequent 7 courses plus a glass of the Chianti we tried! I should point out that these are not sharing dishes – we all got our own portion of each course! These photos are just of mine! Sorbet to clear our palates so we could manage to eat the next course! By the time we had finished the fish course I was relieved that I’d managed to eat everything! When the waiter appeared with a palate cleansing sorbet I knew that meant that there was even more to follow. He must have sensed my panic as he reassured me that we were almost there (it was starting to feel a bit like an eating competition!). I admitted defeat though by this stage and shared out my plate of beef with Monsieur and Mlle. Happily I did recover sufficiently to enjoy my dessert – a wonderful assortment of a gooey chocolate confection, fruit and gelati. When the bill arrived poor Mlle thought we’d have to phone our bank in Australia to arrange a small loan or ask for an increase in our credit card limit! Either that or she’d be washing up in the kitchens for the next month! Fortunately we managed to pay the bill and parted on good terms with the staff! The restaurant reviews that I read for the Galleria were for the most part positive. There were a few negative comments but I didn’t feel that the critics were always being reasonable. For example several diners complained that they were charged for the glasses of prosecco offered to patrons on arrival. Certainly the waitress did encourage us to have glasses of prosecco, which we gladly accepted, but we never expected them to come free of charge! On the other hand quite a number of reviewers (many of whom said they were staying at the Platzl too) said they came back to the Galleria on subsequent nights since the food was outstanding. Each to their own! Ristorante Galleria was not a cheap eatery by any stretch of the imagination though for a fine dining experience in the heart of Munich’s Altstadt it was a wonderful experience and a refreshing change from the traditional Bavarian food we’d eaten up to that point. In the spirit of Oktoberfest wishing everyone a great weekend and “Prost”! I had a vegetarian option on a few occasions in Munich too Anabel as although I’m not vegetarian I don’t eat a lot of meat especially red meat. Good to know that even the Hofbrauhaus has vegetarian options! I remember being in Prague a number of years ago and our elder daughter, who is vegetarian, found the choices very limited there but things may have changed by now. I am not a beer drinker, however, so didn’t partake of the local brews though I did check out the wine lists quite extensively! Prost! Who said the Germans can’t cook? It was an impressive menu at the Galleria that’s for sure though the chef has an Italian sounding name! Some of those dishes look delicious! I haven’t travelled extensively in Germany – but during a short visit I was impressed by the food – and the portions. Certainly the hospitality in Bavaria was excellent Susan and part of that is the generous portions – I couldn’t eat that every day though!! I am really drooling Rosemary…. it all looks incredibly delicious. When I spent my year abroad as a student in Bavaria I came back slightly heavier shall we say!! You can see why. Love the idea of the elderly lady downing copious glasses of the local brew too!! Sounds like a super weekend Rosemary – my husband is sport mad, any sport all sports will do so I will see if he knows about this!! Oh dear Rosemary – fingers crossed the cat feels better soon. Our little kitten has just been for his operation – neutering – so that’s the only drama we had and it all went very smoothly!! Phew.. Thanks Joy it’s certainly been a stressful few days! Hope your little kitten doesn’t get into any mischief!